The Alaska Software Newsgroups are a platform for Xbase++ developers, users of Xbase++ applications, and all others who share an interest in Xbase++ development. We encourage everybody to post any information, knowledge, experience, tips and tricks and the nuts and bolts of the art of development that may be useful to other developers. However, it is absolutely indispensable to comply with the general rules of decency and demonstrate common courtesy in all your postings. By default, anonymous users will have "read-only access"! To post a message, you will have to configure your news reader in order to log on to the news server. If you are already an Alaska Software customer, then you will have to use your login credentials. If you are new to the Alaska Software Newsgroup, then you will have to set up an account first by clicking here. Once you have enabled the authentification, you will be authorized to post messages to the newsgroups. Click on the Accounts menu and select Newsgroup. This will open the Add a newsgroup account window. Please confirm your Display Name and Email Address. Enter Alaska Software's news server news.alaska-software.com in next dialog. Additionally check the My news server requires me to log on box. This is required to post news. Please enter your Alaska Software credentials in the next dialog. Email username is your Alaska Software customer ID (CID) with its matching password. You may use the CTRL key to select multiple newsgroups. In the Tools menu, choose Account Settings. 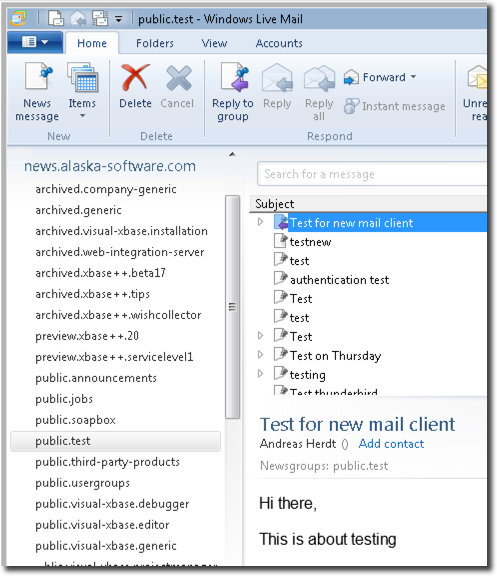 Subscribe to newsgroups by Double-clicking on your new account listed in the left sidebar of your Thunderbird window. Select our newsgroup account and look for newsgroups that interest you. Thanks for you consideration and cooperation! And enjoy the spam-free news-groups!